Holiday? Get A Base Tan! Watch our above video to see learn about getting a tan with us before your winter vacation. Millennium Tanning now celebrating our 18th year in business in Regina with many to come. Ask around, and you will find that most people will tell you Millennium is Regina's best sunbed salons and recommended by most people that know! We have a strong foundation and don't do this as a sideline. Sunbed UV treatments is all we do full time not as a second job/hobby like many places in Regina. Many salons in Regina open and close, but with Millennium you can trust our strength and be confident that we will be open for business indefinitely. At Millennium quality and value is our #1 priority. We want to be sure you get the best value for your dollar. We offer everything from the best priced base bed unlimited in Regina all the way up to the best value on our High Pressure beds that have made us famous. 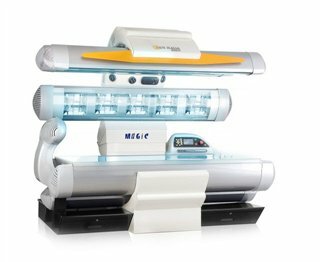 Our advance sunbed systems are state of the art that we maintain on a regular basis. You can be rest assured you will get the tan you desire at Millennium. Two computer networked convenient locations. You can tan at all locations on one package. Newest most advanced tanning systems. Equipment like no other in Regina. Regina's largest and longest running salons. Fully trained and friendly staff. Fantastic reputation. Well known in Regina. Sunbed specialists. Sunbed UV treatments is all we do and we do it best. Like our facebook page to keep up on our current events, specials and giveaways.